It’s a common complaint in professional life – no matter how much you work and sacrifice, promotion and advancement in your career eludes you. There could be a lot of reasons you’ve hit a wall in your career, but often that wall is not a matter of the quality of your work, but of your credentials. Working your way up from the mailroom to the boardroom is one of the tried-and-true success stories for older generations, but today, in a hyper-competitive job market where the odds are usually in the employer’s favor, those stories are few and far between. It should come as no surprise that the fastest-growing, highest-paying careers today are in healthcare, business, and technology; LinkedIn has that pegged in their most recent listing of the most promising career paths. And while entry-level positions in these fields are usually accessible with an associate’s or bachelor’s degree – even a certificate, in some cases – it’s also inevitable that the upper levels of management, with their higher degree of responsibility and pay, would require more education and experience. Frustrated, early- or mid-career professionals may realize that a higher degree would benefit their career, but could be at a loss as to how to earn that degree without giving up their current job. The rapid expansion of online degree programs over the last two decades, however, offers more opportunity than ever for working adults. Master’s programs are especially well-suited to online learning, since the people working toward a graduate degree are usually older, more experienced in their field, and capable of sharpening their skills on their own with less direct guidance from instructors. Online master’s degrees get to the point, providing students with the skills and knowledge to take the next step forward in their career, but in a flexible format that allows them to work around their current schedules without sacrificing work and family commitments. The Value Colleges mission is to provide working adults, career-changing professionals, and other non-traditional students with the information and motivation they need to make smart financial decisions about their educational paths. With an eye toward pointing prospective students in the right direction, Value Colleges has researched 5 career paths that pay the most impressive salaries, on average, and can be entered with an affordable, convenient online master’s degree. 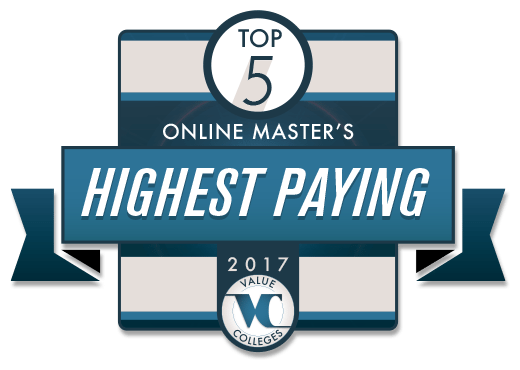 The Top 5 Highest Paying Online Master’s Degrees listing isn’t meant to be a comprehensive or authoritative list; careers are simply listed from highest to lowest-paying*. If the career you’re thinking of doesn’t appear here, take it as an inspiration to seek out your own future with an online degree. *Mid-Career Pay reported from Payscale. Nurse Anesthetists, like Nurse Midwives and Nurse Practitioners, are part of the level of nursing that is usually categorized as Advanced Practice Registered Nurses (APRN) – nurses with higher levels of education and higher responsibilities than conventional RNs. Nurse Anesthetists have an especially important, and often dangerous, job, administering anesthesia for surgery, providing pain management, and counseling patients on medication usage. Analyzing a patient’s health, size, and other factors to determine dosage, and monitoring patients’ vitals during surgery, is literally a matter of life and death, and requires a high degree of training and experience. According to the Bureau of Labor Statistics, the job market for APRNs in general is among the fastest-growing in the nation, projecting an astonishing 31% growth between 2014 and 2024. The combination of a demanding career, great responsibility, and post-graduate education means that Nurse Anesthetists are well-compensated, too – an average of $156,000 per year for mid-career professionals, according to PayScale. With increased demand, many schools of nursing are choosing to develop online Master of Science in Nursing (MSN) programs to prepare working nurses for promotion into the APRN role. While most online nursing programs require clinical practice, most will allow working RNs to do their clinicals at their current job, meaning that often no residency at all is required. It should come as no surprise that corporate management would be one of the best-paying careers; with globalization and the growing complexity of American commerce, with huge corporations, mergers, and government-industry partnerships, good managers who oversee and direct employees are more important than ever. There are many different specialized roles in Management occupations, from finance and banking to human resources and project management, but most of the same basic skills apply. Communication, problem-solving, critical analysis, strategy, planning – all are the hallmarks of a good manager. In most cases, a high-ranking, high-paying managerial position is going to require an MBA to get in the door. In some cases, working professionals who begin their career with a bachelor’s degree may earn promotion to managerial positions with hard work, but for the really profitable positions, lack of a graduate degree will present a ceiling on advancement. That’s why colleges and universities all over the US have spent the 21st century developing online MBA programs that provide flexible and convenient means for a working professional to earn the credentials they need to pull down the $146,000 that PayScale research shows for a mid-career Management specialist. Engineering is a broad field with many, many subspecialties, but they have a number of common features. Whether we’re talking about mechanical engineering, nuclear engineering, agricultural engineering, or electrical engineering, all engineers use a wide variety of technical, analytical, and practical skills to apply scientific knowledge to solve specific problems. Engineers are researchers, designers, and inventors, and whether they are improving infrastructure, like civil engineers, or developing technology to protect the earth, like environmental engineers, engineers draw on the same scientific principles, putting theory to practical use. With such a broad field, it can be hard to pinpoint the rate of growth and income for engineers; as societal needs change, different specialties in engineering grow or decrease in importance, but for the most part the engineering field is growing steadily. At one time, according to Forbes, engineering graduation rates stagnated, but an increase in recent years is working to close a gap between older, retiring engineers and the younger generation. Engineering is a demanding field, and many with aspirations to engineering do not stick it out, making those who persist and earn their master’s degrees all the more valuable to employers. Online degree options have become more common, providing more opportunity for working professionals who want to increase their credentials; with PayScale reporting an average mid-career salary of $137,000, persistence is worth it. Business is changing; globalization, technology, and automation have completely altered the face of American and international business from what it was less than a generation ago, and different times require different kinds of leadership. One of the fastest-growing areas in management includes the kinds of roles that are not typically included in the traditional MBA – areas like analytics, research and development, and operations management. These are the experts who use technology, critical thinking skills, and problem-solving to determine where business systems break down, and to determine how to make them run more efficiently. Areas like data analytics and supply chain management are the newest frontiers in global business. Traditional MBAs tend to focus on more abstract concerns, heavy on economics, finance, and the numbers game. To handle problems such as logistics, transportation, manufacturing, and distribution requires a different kind of manager, more tuned in to contemporary technology and more in touch with day-to-day practicalities. To meet that need, many business schools have created entirely new degree programs, such as the Master’s in Management, or the Master of Science in Management, programs that emphasize data, science, and analysis. For working professionals, online MSM and MM degrees have made catching up with the specialized demand of these fields more convenient than ever, giving professionals with the right stuff a crack at an average of $130,000 annually. Accounting has always been recognized as a sort of perennial career – a good accountant will never be out of work in the American economy. But with the incredibly complex American tax system, which is only exacerbated by globalization and international business, specialists in Taxation are among the most in-demand accountants today. Whether in corporate settings, government agencies like the IRS, or private CPAs specializing in taxes, a Taxation Accountant can expect to make a substantial living, and not just at tax time either, for their ability to save their clients or employers from as much tax liability as possible. According to the BLS, the accounting field in general is expected to grow by 11% between 2014 and 2024, but specializations like taxation may grow even more, due to a shortage of really qualified candidates. And there is much to be made for those who can do the job – an average mid-career salary of up to $129,000. To meet the increased interest from students, especially working accounting professionals who want a higher credential to improve their job market chances, business and accounting schools have developed dedicated programs such as the MS in Taxation and the Master’s of Taxation (MTax), which are quickly becoming the industry standard for tax specialists.